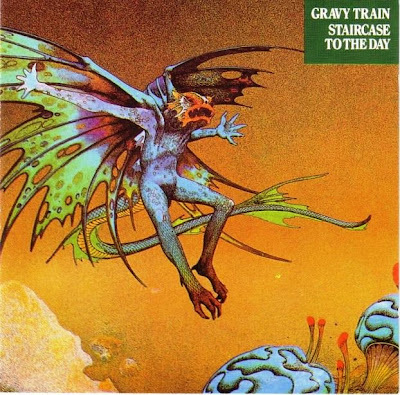 Starting like your typical Vertigo act, Gravy Train's first album sounds faintly like early Jethro Tull, mainly due to similar flute lines, but without a dominating personality like Ian Anderson. Hard-rock riffing is alternated with more quiet and melodic moments and the flute is high in the mix throughout. The tracks are not at all "folky" as some dealers' lists describe them. Some of the music sounds like any old power trio. A nice track is Dedication To Syd (Barrett), a quiet but highly atmospheric experimental piece. Much better is the surprisingly rare second album for Vertigo. The solos are tighter and more controlled and the compositions are better. It is also less bluesy, very crisply produced and features good multi-part singing, greatly enriching their textures. They also try a track with a hook, the lovable Home Again. Lack of commercial success drove them away from Vertigo into the arms of Dawn, while gigging all over the country to create a following. The result, Second Birth, is not very satisfying and actually sounds like a step backwards. Although more diversely instrumentated than either Vertigo album, the songs lack distinction and verve, making this sound like an attempt to please too many people simultaneously. Their swansong, housed in a Roger Dean cover and with a revised line-up, starts with the very best cut they made, Starbright Starlight, a blistering piece of melodious hard-rock, that sets the standard for similarly inclined music (though not many may have heard it, of course). The rest of the album isn't up to the same standard, but the title track with its Bach-derived intro and an unexpected foray into Greek folk, is good too. All in all, a band that plays well, but has too few original ideas to be of more than passing interest. (Marcel Koopman).